The primary purpose of a 360-degree feedback review is to help employees better understand their strengths and developmental opportunities. This process is greatly enhanced by engaging the employee in a conversation about their results immediately following the review. The article below provides you, the debriefing manager, some tips on how to achieve results in the debriefing conversation and subsequent development planning discussions. Assist the employee in understanding his or her feedback. Identify themes in the ratings and comments received from raters. Listen to the employee's concerns about ratings or written feedback that he or she disagrees with. Help the employee move beyond resistance and defensive reactions so that he or she can benefit from the feedback. Prioritize behavioral areas that require development. Create an action plan for developing strengths and addressing weaknesses. Identify three to five key strengths and three development areas from the ratings or written comments. Detect and consider removing outlier data or unconstructive feedback. 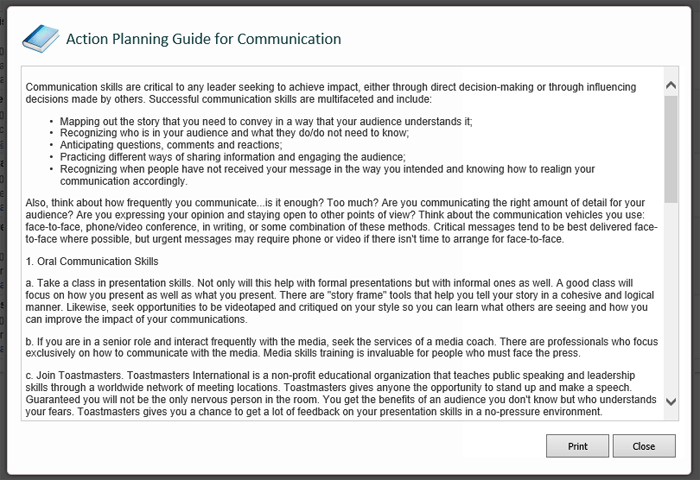 Be prepared to summarize the feedback to the employee in your own words. Highlight written feedback from raters that is particularly informative. 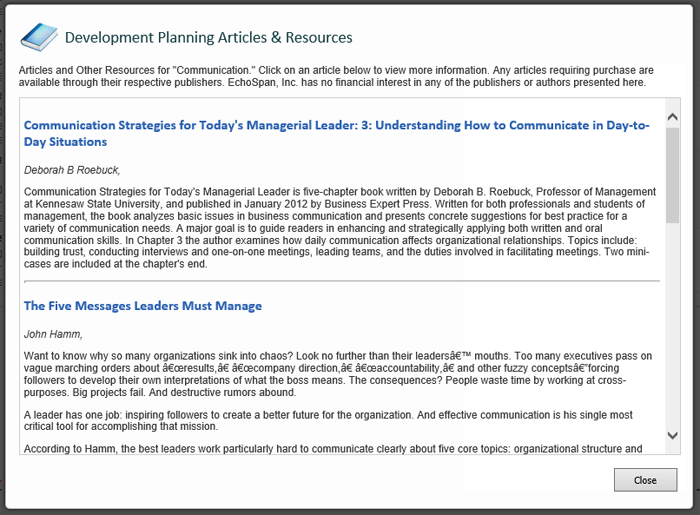 If using the EchoSpan Development Planning Module, create a draft development plan for the employee to review during the meeting. The results of a 360-degree feedback review represent observations made at a particular point in time. Once ratings are received, it is important to schedule a meeting with your employees in a timely fashion. This way the information contained in the 360 report is as fresh and relevant as possible. Similarly, only recently conducted 360-degree feedback reports should be used for developmental planning purposes. If the report is more than six months old, or the employee has experienced a change in position since a review was conducted, consider updating their report with new feedback first. Take some time to consider how you think the employee may react to the feedback. Consider not just the feedback but what you know about how this employee typically handles feedback. A normally tough person may not be upset by difficult feedback. A normally sensitive person may be upset by things that might surprise you. If, after reviewing the feedback report you determine that its contents are likely to upset the employee, consider hosting the meeting offsite or at a time when he or she is less likely to feel defensive. Be sure to set aside enough time to discuss the report as well as frame an action plan. This usually means at least an hour, but ninety minutes is best. You want to be certain that you have enough time to start outlining a development plan based on feedback results. This helps the employee see that the feedback they have received, even if perceived as negative, is being directed to a positive, constructive outcome. Avoid splitting the meeting into multiple sessions. It's usually best to present the feedback report to the employee a day prior to the meeting or at the meeting. This is so that any conclusions that the employee reaches by reading it can be addressed quickly. If the employee hasn't read her review report already, let her do so. Sit quietly while she digests the information it contains. Once the employee has read the report, ask what her reactions are. Once you let her process her reactions, and express empathy for what she may be feeling, then move on to the content. Ask her what she thinks the underlying themes are. These may or may not line up with your pre-identified strengths and developmental opportunities. If both of your observations align, this is a good time to begin the discussion on development planning. If you disagree on the key observations in the report, discuss them and try to work toward a common agreement on areas for improvement. Make sure to focus the employee on no more than three strengths and three development opportunities. If the employee wants to focus on more, help her to prioritize the list and have her start with the top three. When she accomplishes one, she can add another one to the plan. It's also a good practice to walk through written comments in the report together. Written feedback usually contains the most telling observations on behaviors. Have the employee discuss specific examples where praise or criticism has been documented. If an employee states that she knows who said what, let her know that it is not important to focus on who the feedback came from but rather to focus on what she may have did to generate the feelings that the employee experienced. Focus the employee not on what she intended, but on how her actions and behaviors were perceived by others. Avoid distractions during the meeting. Turn off your phone. Do not check email. The employee needs to know that the company is committed not only to gathering ratings on his behaviors, but also that he understands and grows from the process. Listen. Let the employee voice his concerns about the feedback received. Do not entertain discussions on "who wrote what" or attempts to identify particular raters. If the employee believes that he has been unfairly treated in the feedback process, proceeding with a development planning discussion will be difficult as the employee will question the legitimacy of the report. Stop the conversation and let the employee know you'll voice his concerns to the review administrator. Then, discuss the situation with the review administrator to see if a particular rater's feedback should be removed. Feedback from co-workers can sometimes be difficult to accept and there sometimes can be a tendency to hone in on one particular comment or rating. If this happens, be prepared to redirect the employee to focus on the more general themes from the feedback and why they are important. Identify the behavior and/or competency to be developed. State an objective. What does the employee seek to do better? Create measurements. How will the employee measure progress against the objective? Take action. What activities will be done to achieve the objective? By what dates should actions be complete? Document the outcome. What was the result of the actions? It's important to track progress on the development plan regularly. In the debriefing meeting, put a follow-up meeting on your calendar to check-in on the progress of the plan. 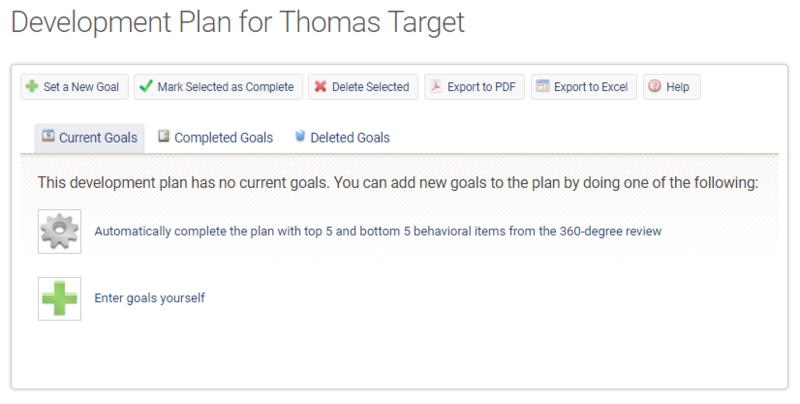 Using the EchoSpan Development Planning Module, you can create automated reminders as each development plan item reaches its stated milestones. There are situations when it is beneficial to conduct reviews more frequently than once a year. Employees who have significant deficiencies in behavior can benefit from more regular feedback. Behavioral changes usually takes place after the person is made aware of the issue and motivated to make changes. Regular feedback on a deficiency can be the motivator that a manager needs to improve his/her behavior. Once a manager understands that they will not be able to ignore the problem any longer, they will either make improvements or deselect themselves from the position. Your support for the manager in making changes is critical. It is difficult for someone to make significant changes without support. While employees need to take responsibility for their own development, they still need support and encouragement to make change happen.